The Thirteen Best OUR MISS BROOKS Episodes of Seasons Two and Three | THAT'S ENTERTAINMENT! Welcome to another Situation Comedy Tuesday! Today we’re continuing our three-week series on the best episodes from the TV version of Our Miss Brooks. Though a few episodes have been featured on cheap public domain sets, the series has never been given an official release. However, I have a DVD-r set containing 126 of the 130 episodes, all of which have been recently uploaded to YouTube. Now we can all watch Our Miss Brooks! So I’m thrilled to present these posts — the first EVER guide to the best episodes of Our Miss Brooks! Miss Connie Brooks, an English teacher at Madison High, often clashes with her pompous principle, Osgood Conklin, Jr., while trying to educate the rambunctious Walter, her student and close confidant, and attempting to snag, Mr. Boynton, the clueless biology teacher across the hall. Miss Brooks’ other friends include Mrs. Davis, the eccentric widow who rents her a room, and Conklin’s preppy daughter Harriet. Our Miss Brooks stars EVE ARDEN as Connie Brooks, GALE GORDON as Osgood Conklin, Jr., ROBERT ROCKWELL as Philip Boynton, RICHARD CRENNA as Walter Denton, JANE MORGAN as Mrs. Davis, and GLORIA MCMILLAN as Harriet Conklin. Our Miss Brooks is, without a doubt, one of the funniest shows of the ’50s. Eve Arden is as brilliant a performer as Ball and Gleason. She elevates every sharp and sardonic script with her unique performance. She is assisted ably by her co-stars, but this is unquestionably Arden’s show. 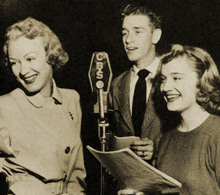 Our Miss Brooks began as a successful radio series in 1948, featuring Arden, Gordon, Crenna, Morgan, McMillan, and Jeff Chandler as Boynton. The show moved to the small screen in 1952, utilizing many of the same scripts from the radio, but with a new Boynton in Robert Rockwell. 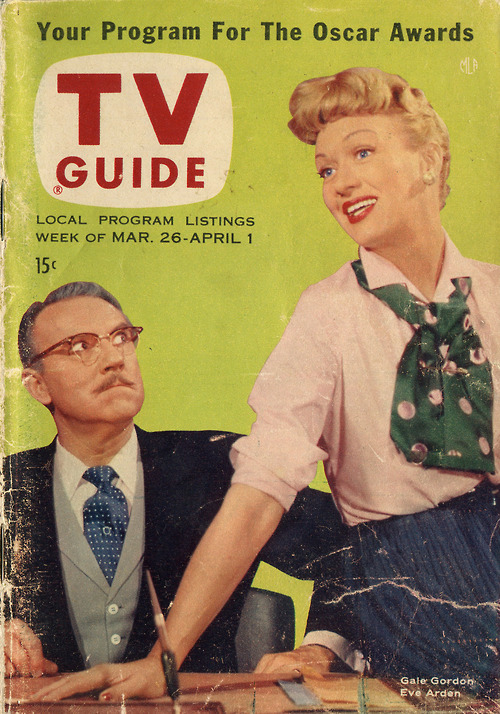 For the next three years, Our Miss Brooks aired simultaneously on radio and television to much success. However, during the 1955-1956 television season, the decision was made to transfer Miss Brooks and Mr. Conklin to Mrs. Nestor’s private elementary school. Morgan stayed on as Mrs. Davis, but all the other characters were axed. The change in format (and creative team) proved toxic, and near the end of the season, Mr. Boynton was welcomed back to the series. But it was too late; the TV series was canceled after four seasons. 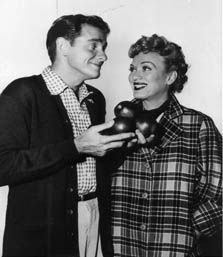 The radio series ceased producing original episodes around the same time, but still continued to air repeats well into 1957. However, Our Miss Brooks soon found itself on the big screen with Warner Brother’s 1956 film of the same name, which ignored the events of Season Four and finally united Miss Brooks with Mr. Boynton. I told you last week that Season One is the strongest from the TV series, but though each proceeding season declines in quality, Season Two still stands as a strong collection of episodes, containing some of the series’ best. However, Season Three marks a major step down, with many forgettable episodes. But I must alert you: I have only seen 30 of the 31 Season Two episodes — I’m missing “The Bakery.” And I have only seen 28 of the 30 Season Three episodes — I’m missing “Blood, Sweat, And Laughs,” and “The Dream.” (If anyone has these episodes, please let me know!) For readers uninterested in beginning with the radio series (almost 200 episodes of which can be found online), I’d recommend starting with Season One. But all of the following episodes can be found online as well. Simply go on YouTube and search for the episode of your choice. All but the three mentioned above are available to watch from Seasons Two and Three. If, by chance, these episodes are taken down, contact me and I can assist you in obtaining them. Bones Snodgrass’s romantic poems to Harriet Conklin set off a chain of love letter mix-ups! This is a hilarious episode and one of the series’ best. I actually prefer Bones, who was used in late Season One and early Season Two, to his more regularly featured brother, Stretch, even though they both serve the same function. A classic misunderstanding involving love letters (we’ve seen it on other sitcoms) is handled superbly by an A+ script and cast. While seeking an invitation out to Thanksgiving Dinner, Miss Brooks finds herself saddled with a gaggle of guests and a tiny turkey. The entire cast ends up at Connie’s for Thanksgiving. Like in Friends, any time the ensemble of a series ends up together in the same room, it’s normally a superior effort. A funny show, this was one of the most memorable from the season. Miss Brooks buys a “magic” Christmas tree that seems to enchant all who touch it — they became enamored with her! This was adapted from a radio script that was performed almost every year at Christmastime. It’s one of the series’ sweetest, with the ever-popular “Was it a dream?” bit. With many laughs, and a cheer-worthy kiss between Miss Brooks and the suddenly hunky Mr. Boynton, this is an incredibly enjoyable episode. As Miss Brooks escorts a handsome education expert around the school, she schemes to snare Mr. Boynton by making him feel ancient. This episode really had me laughing. The largest stuff involves Connie’s attempts to make Boynton feel old after the biology teacher says he’ll settle down when he’s too feeble for anything else. That’s great. 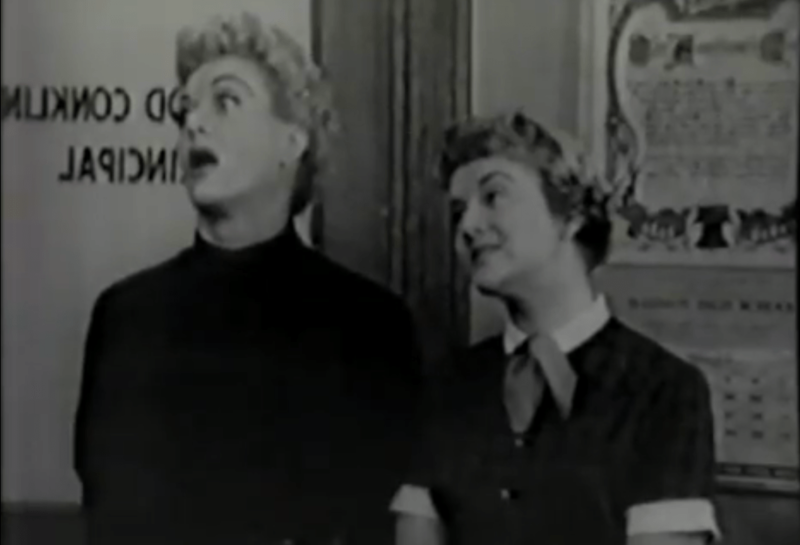 But I REALLY enjoyed Miss Brooks and Harriet’s fawning over the British education expert, which is truly hilarious. An excellent script and another one of the series’ best. After a disastrous test, Mr. Conklin orders Miss Brooks to tutor students after school. I like seeing Miss Brooks actually teach, and though the only kids we ever see (besides Harriet) are ungifted in English, the joke is always funny and never gets old. So once again, stupid kids make for hilarity. Miss Brooks tries to prove that she’s unqualified to take over Miss Enright’s first aid course. 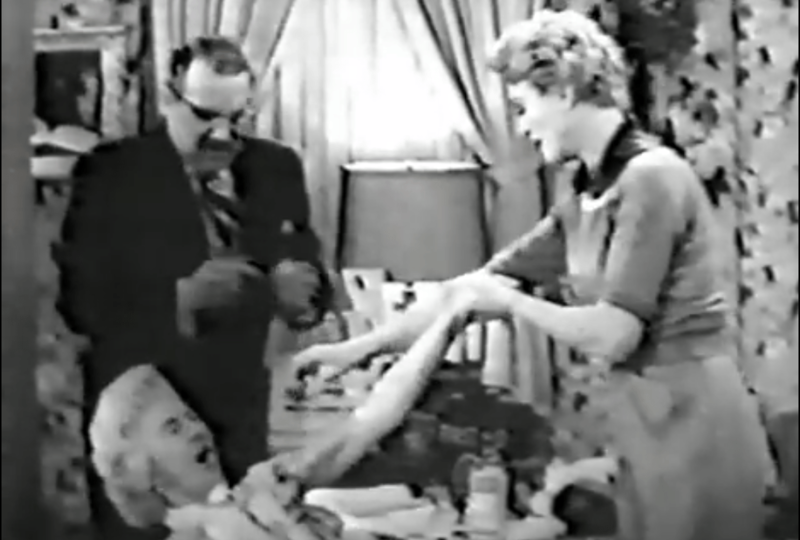 This episode has two major things going for it — the cattiness that naturally comes with interactions between Miss Brooks and Miss Enright and an excellent physical bit where Miss Brooks purposely louses up her first aid demonstration. 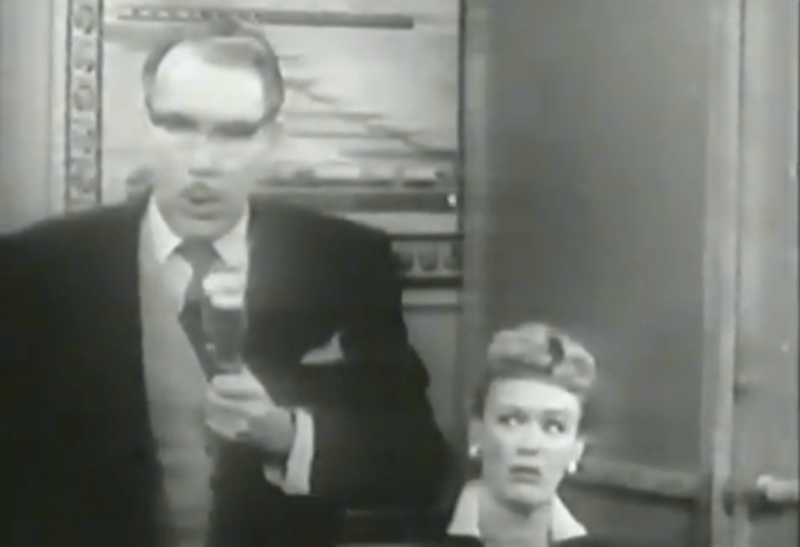 Another great appearance by Mary Jane Croft, and another excellent performance by Eve Arden! Miss Brooks and company’s audition for Deacon Jones’ Hillbilly Troupe coincides with a visit from a member of the board of education — Mr. Jones. This is one of the series’ silliest episodes, and it’s almost too broad for a typical Our Miss Brooks episode. However, the story is a lot of fun and the actors are evidently enjoying themselves, which makes this episode worthwhile. 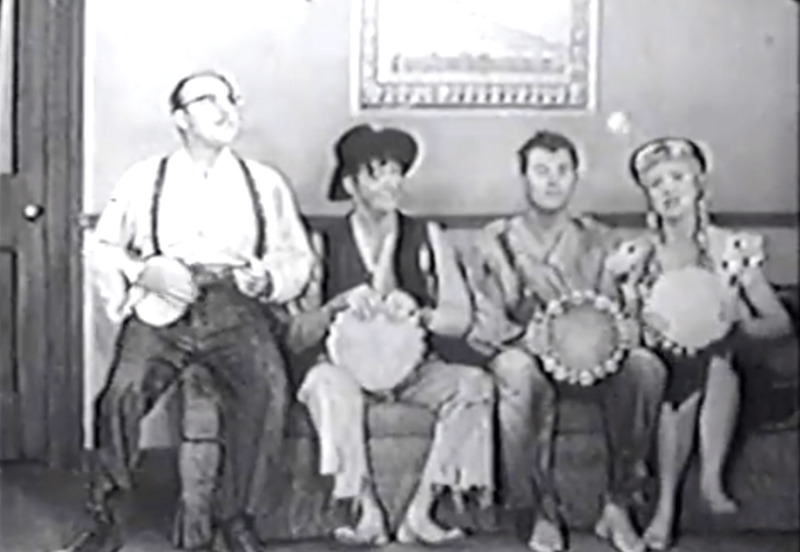 Gale Gordon as a hillbilly is choice, and Frank Nelson gives one of his best TV performances. Miss Brooks and Mr. Conklin pose as Stretch Snodgrass’s parents to prevent a rival principle from poaching their star footballer. One of the series’ more farcical efforts has Brooks and Conklin donning crazy outfits as they pretend to be Stretch Snodgrass’ folks. It’s not only screamingly funny, but the comings and goings of other characters during the shenanigans makes for excellent comedy. Miss Brooks takes the fall for a robbery that she thinks was committed by Mr. Boynton. This is a funny, if ordinary, script with a funny, if ordinary, misunderstanding. The reason it makes my list is the sight — just the sight — of Mrs. Davis with a “gun.” That moment made the entire episode worth it for me. Walter and Miss Brooks convince Mr. Conklin to pre-record his speech to the Board of Education, but things do not go as planned. This is probably the best episode from Season Three. Conklin is nervous before a speech and is talked into pre-recording and then lip-syncing to the track. Of course, the tape is altered and Conklin ends up looking like a fool. Like in I Love Lucy’s “Home Movies,” this gag always seems to work exceedingly well. With many laughs, “Public Speaker’s Nightmare” is a breath of fresh air after a stretch of less-than-adequate episodes. 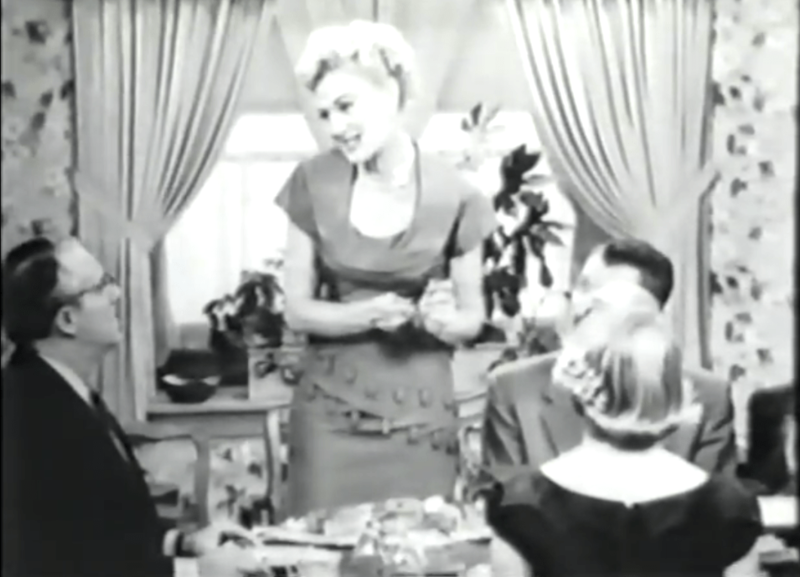 Miss Brooks accidentally auctions off all of Mr. Conklin’s new furniture thanks to a mix-up by Stretch Snodgrass. This isn’t an outstanding episode, but the situation, a typical Our Miss Brooks mix-up, allows for plenty of comedy. In a relatively laugh dry third season, this episode does rather nicely. 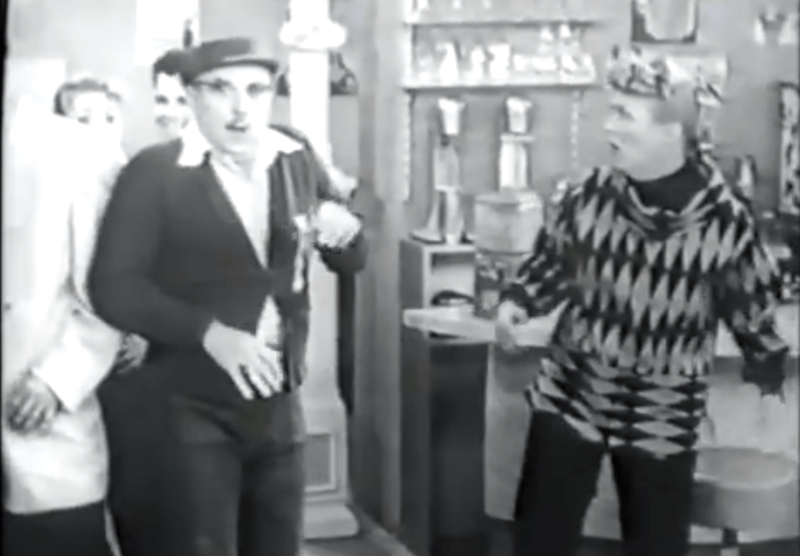 A mambo craze sweeps through Madison High and after a dancing joint is declared off-limits, Miss Brooks ventures there and runs into Mr. Conklin. This episode relies on a couple of funny dance numbers and sight gags involving our favorite teacher and principle at a mambo club. It’s an amusing episode, not brilliantly written, but very funny and a definite cut above the rest of the season. Mrs. Davis pretends to be wealthy when an ex-boyfriend comes by for a visit. But the charade is difficult to maintain when the bill collectors come knocking! *** UPDATE – 03/17/14: Though not in my possession, I have viewed “The Dream,” one of the three missing episodes listed above. Not a great installment, but definitely an amusing excursion. If anyone has this in their personal collection, I’d still like to add it — along with the other two: “The Bakery” and “Blood, Sweat And Laughs” — to mine as well. *** UPDATE — 07/30/14: It seems like the Youtube account which had uploaded 126 of the 130 episodes has been taken down by CBS. Is that DVD finally in the works? ***UPDATE — 08/29/16: Our Miss Brooks is finally coming back to television. It will be shown regularly at 5:00 am on Me-TV. 127 of the 130 episodes are included in the syndication package (including the still elusive “The Dream”), but they will be of better visual quality than the copies that currently circulate! Come back next Tuesday for the best Our Miss Brooks episodes from Season Four. And tune in tomorrow for another Wildcard Wednesday post! Have always loved the Christmas shows. 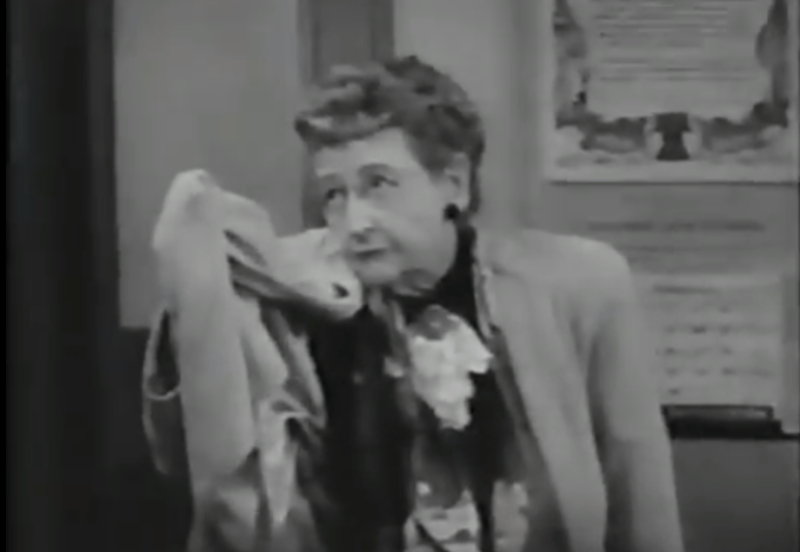 The first season Christmas show was also good, but the print on YouTube, (and I assume your DVD) is missing some pretty funny dialouge between Sherry’s department store manager (Florence Bates) and Connie. 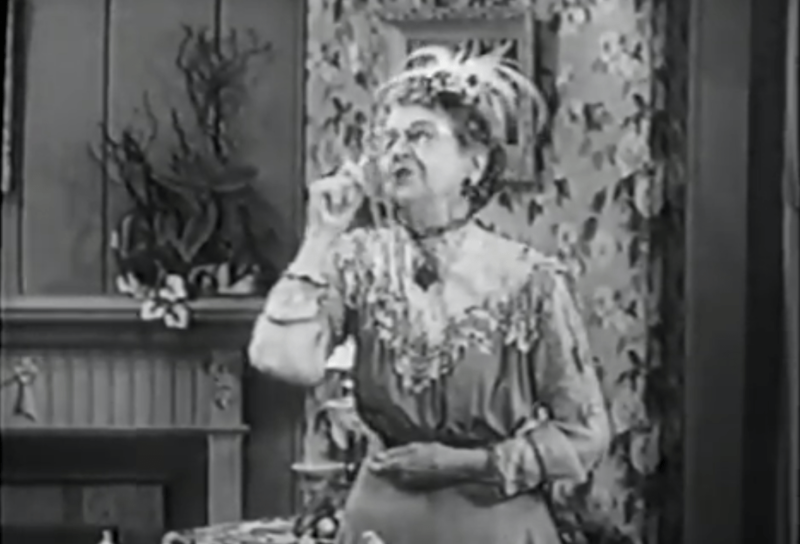 She is, throughout the show exchanging her girly gifts of perfume for manly gifts for her friends: Mrs. Kearny: “A Pipe?! You want a Pipe?” Connie:” Doctor’s orders. He told me to cut down on cigars.” My favorite line from the second season Christmas show, Connie crooning to Minerva from the rocking chair: “Jingle Bells, Jingle Bells and merry stuff like that. Oh what fun it is to rock with a big fat drunken cat”. I also want to make special mention of Jesslyn Fax as Mrs. Davis’s sister Angela. The two of them were marvelous together. She really shines in the episode where she tells everyone she has one month to live. It should be mentioned that Angela’s character was brought more prominently into the show when Jane Morgan, who played Mrs. Davis suffered a stroke. Doctors weren’t sure if she would be able to continue on the show, but she miraculously recovered to give us many more memorable Mrs. Davis moments. The cat who occaisionally appeared as Minerva was actually Orangey, a famous cat who appeared in the hilarious 1951 film Rhubarb, directed by Arthur “Mister Ed” Lubin. He (Yes, Minerva was a female impersonator) also won a Patsy award as “Cat”, Audrey Hepburn’s NY roommate in Breakfast At Tiffany’s. The last credit I saw for this remarkable animal was in a 1964 My Favorite Martian episode, where he actually gets screen credit as “Rhubarb”. This remarkable thespian can also be seen as Elly May’s cat “Rusty” in early episodes of The Beverly Hillbillies. Hi, Leslie! Thank you for clearing up some confusion I had about why Morgan was absent for a stretch of Season Two episodes. I figured it was an ailment. How grateful I am that she was able to return! She managed to elevate some of those difficult Season Four episodes. While I favor sasons 1 thru 3, there were some funny episodes and characters in season 4. As you are reviewing that season next week, I’ll refrain from sharing my thoughts about this final season until then. Your reviews of this show (indeed, the first I’ve seen) should win you the “Yodar Kritch Award”! Thanks, Leslie! That was my primary reason for starting the blog — providing guides to the best episodes of my favorite sitcoms. For some series, like OUR MISS BROOKS, there’s no where else to look! Pingback: A Very Sitcom Thanksgiving | THAT'S ENTERTAINMENT! Pingback: Spring Break Research RECAP (I of II) | THAT'S ENTERTAINMENT! 1) Episode 40: “Bones, Son Of Cyrano” (Aired: 10/09/53). The IMDB lists the actor who played the part of, Bones (Stretch) Snodgrass as, Eddie Riley. The actor who played the part is, Eddie Ryder. Perhaps the IMDB has the name wrong or Eddie Ryder used a pseudonym? Yes, that’s definitely Eddie Ryder. I can’t confirm whether or not he’s credited as Eddie Riley because all of Bones’ episodes that circulate feature the generic syndication closing credits, in which no guest stars are credited. I believe that Ryder was billed correctly, however, because IMDb is the only primary source with the mistake. Users should be able to correct false information on IMDb — please do so! Absolutely — always happy to hear from fellow OUR MISS BROOKS fans. CBS hasn’t made it easy for us; hopefully that’ll change soon! Hi, Miles! Thanks for reading and commenting. That description doesn’t ring any bells. If you’re remembering it correctly, be sure to record OUR MISS BROOKS as it runs on Me-TV — 127 of the 130 episodes are in the package, and if the scene in question was something you’ve seen within the past few decades, it’ll be included in this lot.